Do you currently feature an internal site search for your visitors? And if you do, are you sure you’re taking advantage of its potential? What you may not realize is how valuable it can be for your SEO and PPC campaigns and, more importantly, your website’s conversion rate. As an SEO and PPC manager, I’m often asked how I begin my keyword research process. While it’s difficult to break it down to an exact formula, since each website is circumstantial, regardless of the website, I always do my due diligence on what visitors are looking for upon entry and when browsing that particular site. Doing this puts me in the proper mindset to understand the most useful keywords to the site and to its visitors. How do I do this? Naturally the keyword traffic sources report is quite helpful, but one extremely valuable report that I find is often overlooked is the internal site search tracking report in Google Analytics. Having this internal search data helps a great deal when it comes to setting up an effective campaign. When this reporting functionality is set up properly in advance, I know I have a solid foundation to the SEO or PPC keyword list. By understanding how your visitors who are engaged on your site (as opposed to simply landing on your site and may end up bouncing anyway) perform searches, you can have a better understanding of keywords you should be targeting with an SEO or PPC campaign. Besides the keyword data, an internal site search has plenty of other advantages as well. Because so many sites offer this option and with expectations set by popular search engines, users have become acclimatized to the idea of search quickly providing exactly what they are looking for. They count on search for immediate and accurate results. Visitors to your website should be able to find exactly what they’re looking for as quickly and efficiently as possible. Bridging the gap between your visitors and the information on your site is made possible with the implementation of a site search. In fact, many companies claim that search is the primary means of navigation on their site while a large percentage of web users admit to using site search to find the information they need – many who admit to abandoning a site with poor search functionality. By connecting your visitors to products and information quickly and easily, you increase the likelihood they will perform a desired action on your site. This can even reduce customer service costs by connecting users to the product and service support information they need. • An increase in revenue? • An increase in conversions? • Increased average order size and value? • Increased frequency of purchases? • A decrease in bounce rate? • Increased cross-sell and up-sell opportunities? •An increase in the length of each visit? • A solid foundation to your keyword list? Here’s an example. 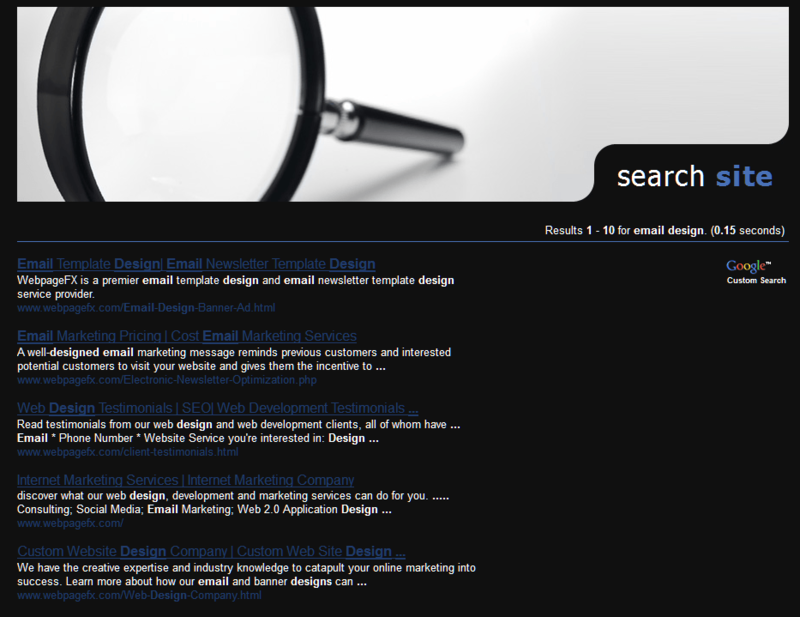 Our site search on webfx.com provides visitors with a whole page of results based on what they are looking for. For example, I typed in email design in our search, of which elicited an entire page of web pages on our site that mention our email design services. This is extremely beneficial not only for our users, but for us as well. By looking at the data, we know that users were either 1) interested in our email design services, 2) were not aware that we offered such a service or 3) could not find it on our site as efficiently as they would have liked. Configuring the tracking is easy. In Google Analytics, simply navigate to your profile settings and main website profile information. Obviously, you’ll want to mark “do track site search.” Then the query parameter is what Google should look for when determining the search query. It’s easy to figure out what yours is, simply perform a search and look for your search query. Look confusing? Allow me to break it down for you. All you need to know is the search query parameter. You can find this by finding your search query (“email design”) in the URL string and looking at the parameter directly in front of it. In this instance it is the “q=”, in other words, “query=”. The ‘+’ simply represents a space. This tells me that the query parameter in Google should be set to “q” – as we’ve done. And there you have it, an entire list of search terms your visitors used not to find your site, but to find information within your site. From there, you can drilldown to see which page those users found the most relevant and voila, you have the information you need to know which page should be ranking in Google and the other search engines for that specific search term. Are You Turning Away Potential Customers? I’m not saying it’s absolutely paramount to have site search functionality on your site, especially if your site has very few pages, but I’m also not saying there aren’t ramifications to not having one. This data is incredibly valuable, and by neglecting its implication, you’re ignoring visitor feedback readily available to you. It can certainly provide actionable data well beyond keywords to use in your SEO and PPC campaigns. Understanding how users interact with your site can do wonderful things for your conversion rate. If a particular search query is searched often, you may be able to conclude that 1) information on that particular product or service is not easy to find or does not provide enough information to your visitors or 2) that a large percentage of your visitors are looking for that product or service in particular when they browse your site. You can then use this as actionable data to provide either more information or making that information more obvious in the navigation. Keep in mind some users automatically perform a site search as a part of their nature regardless of how easy it is to find what they’re looking for. However, if there are dozens of searches for one particular product, that should certainly tell you something. If your online store has hundreds of products, you may want to consider implementing a site search to help your customers find what they need quickly. I truly believe if you have an ecommerce store, particularly with hundreds or thousands of products, if you don’t provide your visitors with a site search and they can’t find what they’re looking for in a matter of seconds, they will be onto the next site that is easier to navigate. The implementation of a site search can help your online shoppers quickly filter through thousands of products in a matter of a few mouse clicks. Let’s face it, these days people are impatient and lazy and don’t want to search for anything, and if they can save time to get what they’re looking for faster, they’ll do it. Can you really blame them? Users aren’t used to having to manually search through hundreds of category listings to find what they want. When they are ready to make a purchase, they know exactly what they want. Why not help your visitors out and help them find what they’re looking for faster, letting them make a purchase from you before they become frustrated and leave? Perhaps you’ve tested versions upon versions of your main navigation, and you have the best navigation you could possibly have. While that’s all well and good, there are still some users who are accustomed to always using the site search because they know what they’re looking for and they want to get there fast. Even with a smaller inventory or amount of pages, your navigation could suffice, but why not offer this functionality to users who look for it? As on online retailer, you can benefit greatly from this simple addition to your site by experiencing increased conversion rates, increased average order value and increased customer loyalty. By implementing a site search, you can also decrease the likelihood of visitors abandoning your site upon entry and possibly downgrade that pesky bounce rate. Site search helps shoppers find the product they’re looking for much more quickly and efficiently, significantly increasing their satisfaction and likelihood to ultimately make a purchase. If site visitors can find what they are looking for quickly and easily, they are much more likely to make a purchase. On the other side of the spectrum, they are more likely to abandon the process and try another site if they can’t find what they need within a few minutes. Within the site search results, you can also index an entire directory of products relating to the user’s search query, which could potentially increase the user’s order value. This encourages browsing-to-buying behavior, which can certainly increase your conversion rate. And by offering highly personalized search and recommendations to a specific shopper, advanced site search can help increase customer loyalty. Substandard internal search results equate to lost sales. Your visitors often do not have the time (or want to take the time for that matter) or the patience to try different variations of search keywords and phrases. If you currently have a site search in place, it’s possible that it is too basic and actually frustrating your visitors or providing inaccurate information. You want to ensure your site search has the ability to understand typos, spelling errors, synonyms and ambiguous search queries. Search functions have the tendency to elicit the “no matches found” result simply due to common blunders like spelling errors for products that are actually carried. When this happens, many users become irritated and ultimately end up abandoning a site altogether. Make sure you’re not losing potential customers because they are provided with inaccurate information upon searching your site! Are you taking full advantage of the site search functionality on your website?